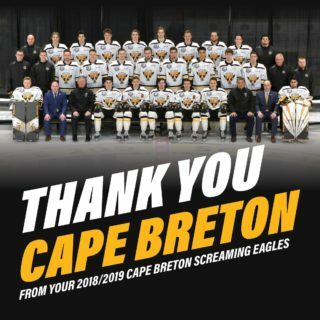 The Cape Breton Screaming Eagles announced today that the team will host two free skates, a teddy bear toss, a food drive, and have launched a holiday family package for the month of December. The Screaming Eagles will host the first of two holiday skates on Sunday, December 2nd at the Emera Centre Northside from 1:30 PM to 2:20 PM. There is no charge and all are invited to come meet the team and get some autographs. The second free skate will take place later in the month, on Saturday, December 29th, at Centre 200 at 2 PM. 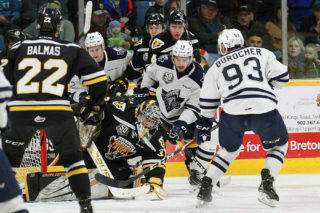 On Saturday, December 8th, the Screaming Eagles will hold their annual Teddy Bear Toss game when the Québec Remparts, coached by Patrick Roy, make their only visit of the season to Centre 200. This annual event is presented by Max 98.3 and plush toys collected will be distributed by the Salvation Army and Every Women’s Centre. Fans attending the game are encouraged to bring a teddy bear or plush toy to throw on the ice when the Screaming Eagles score their first goal. Sunday, December 30th will be the beginning of the annual Hurley Cup series between the Screaming Eagles and the Halifax Mooseheads. 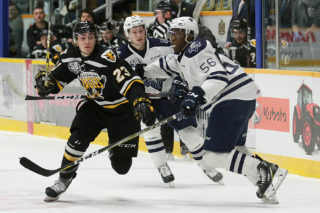 The Screaming Eagles will play the first game against the Mooseheads on December 30th at 2 PM at Centre 200, and the second game the following day at 2 PM at the Scotiabank Centre in Halifax. The winner of the annual holiday series will be decided on aggregate scoring. Goals scored in the opponents building will serve as the first tie-breaker. 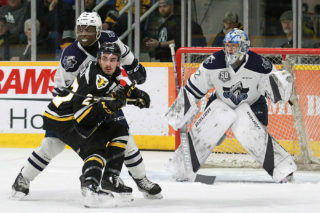 The Screaming Eagles and Mooseheads will once again wear special Battle of Nova Scotia themed jerseys which will be raffled off to fans at the game. Fans who bring a food bank donation to the game in support of Feed Nova Scotia will receive a ballot to win one of the game-worn jerseys. The team also announced a Holiday Family ticket package for the month of December. A special price of four tickets for $40 for any December home game. Tickets must be purchased for the same game, and additional tickets can be purchased at a rate of $10. Visit the C200 Box Office for complete details.